Though it is perceived the human beings have successfully combated plague in the 20th century we still have some cases “crop up” in some countries and everyone has to be aware what that decease is and how to face it. The Yersinia Pestis bacteria causes sporadic cases in humans and is transmitted by bites of fleas and rodents. Pulmonary form of plague can be transmitted from person to person. Bubonic plague which is characterized by painful lymphadenopathy or buboes, fever, headache, immobility, pain and defeat of the abdominal cavity after the 2-7-day incubation period. Insect bite usually goes unnoticed, but a small crust may indicate the place of the introduction of the parasite. 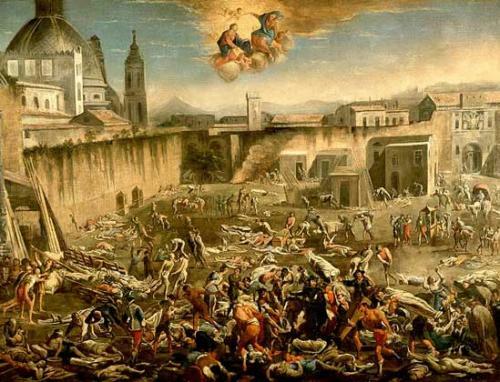 Untreated bubonic plague is usually leading to sepsis and decrease blood pressure being followed by death in 2-10 days. Pneumonia develops in 10-20% of the cases and it is characterized multilobular defeat and release Y. pestis from sputum. The disease proceeds rapidly if left untreated and death occurs after 2-6 days. Diagnosis is based on the result of staining with Giemsa aspirate from the bubo in a smear detect bipolar shape, similar to safety pins. Results of studies are normally being seen in 48-72 h and are generally positive. Serological results may also confirm the diagnosis. Assign streptomycin in a dose 7,5-15 mg / kg every 12 h for 10 days. Tetracycline in 5-20 mg / kg every 6 hours. Patients with pneumonic plague should be strictly isolated, and contact persons should undertake a course of tetracycline 250 mg by mouth 4 times a day. The fall in blood pressure during bubonic form itself must be regarded as a sign of the generalization process, a sign of sepsis, while there is a need for resuscitation, administration of dopamine, the establishment of a permanent catheter. When the pulmonary and septicemic forms of plague dose of streptomycin is increased up to 4-5 g / day for forms that are resistant to streptomycin, chloramphenicol can enter suktsinatdo 6-8 g. In order to improve the state of doses of antibiotics reduce: streptomycin, 2 g / day to normalize the temperature, but at least 3 days, tetracycline, 2 g / daily by mouth, chloramphenicol with the doze of up to 3 g / day, total 20-25 g. Biseptol is also a very effective remedy in a battle with plague.